Here's a list of findings based on FlylinkDC (r408) x64 build 5645. By default 50 manual segments per file (maximum of 200). 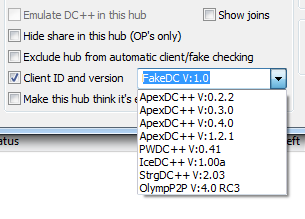 ApexDC/StrongDC are disabled by default and 10 max. Disconnect slow downloads is disabled by default. ApexDC/StrongDC enabled by default. Upload limit can be set to 1kB/s with unlimited download speed. ApexDC/StrongDC algorithm used to stop leeching. Favourite hub properties allows faking client tag as shown in screenshot. Can also fake number of hubs connected to by fooling hub to think its "exclusive" (option is partially hidden in previous screenshot). You could theoretically set your upload speed to 1kB/s and take 200 user slots per file at 1kB/s even though you utilise your maximum download speed. Disconnecting slow downloads means that rather than downloading slowly off all 200 users, you only download off the necessary users to sustain your maximum download speed. This keeps slots open for others. This is just an educational post for anybody not wanting to install it themselves. I sent a PM to IRainman[RU] explaining issues with these settings but no response so far.